Located 5 miles from the Las Vegas Strip, Boulder Station Hotel and Casino offers plenty of entertainment, dining, and gaming options. 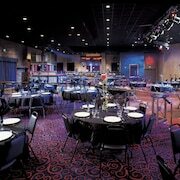 In addition to an expansive casino, guests enjoy an 11-screen movie theater, and a concert venue that hosts headlining acts and other events. Dining options include a seafood and steak grill, Mexican and Italian restaurants, a 24-hour cafe, and a buffet restaurant. A food court includes Winchells, Burger King, Starbucks, and Subway. Other amenities include a computer station, free valet parking, laundry facilities, and luggage storage. Newspapers are included in the property's resort fee. Boulder Station Hotel and Casino offers a casino featuring slot and video-poker machines, table games, a race and sports book, a 600-seat bingo parlor, and a poker room. Guestrooms at Boulder Station Hotel and Casino offer free wifi, flat screen TV's with cable and pay per view movie options, adjoining rooms available upon request. Boulder Station Hotel and Casino offers 299 air-conditioned accommodations with complimentary weekday newspapers and hair dryers. 40-inch flat-screen televisions come with cable channels and pay movies. Bathrooms include shower/tub combinations and complimentary toiletries. Guests can surf the web using the complimentary wireless Internet access. Business-friendly amenities include desks and phones; local and long-distance calls are complimentary (restrictions may apply). Additionally, rooms include irons/ironing boards and blackout drapes/curtains. Housekeeping is provided daily. Headliners take the stage at the Railhead events center, which also presents boxing and other entertainment throughout the year. Comprising 90,000 square feet, the casino includes 2,800 slot and video-poker machines, table games, a poker room, 600-seat bingo parlor, and a race and sports book with 18 big-screen TVs. An 11-screen multiplex is located inside Boulder Station, offering family-friendly entertainment with comfortable recliner seating. The Boarding Pass is a complimentary card that consolidates members' slots and table play into single accounts for 10 Nevada casinos. Play earns cash-back points and room and restaurant comps.